Holland Releasing proudly presents the results of a five-year digital restoration of this gothic horror classic -- and the very first zombie movie ever made. Restored from a long-lost 35mm print, this is Bela Lugosi's masterpiece. Filmed by two young brothers in 1932 -- borrowing sets from Frankenstein, Dracula and the Hunchback of Notre Dame -- it shocked audiences with its Pre-Code sexuality and storyline, breaking box office records. But then the film and its negative disappeared for over 80 years. Now, looking resplendent on the big screen once more, WHITE ZOMBIE - THE RESTORATION will soon be in movie theaters worldwide. As an added bonus, most theater screenings will also include the racy Pre-Code Betty Boop cartoon "Is My Palm Read?" 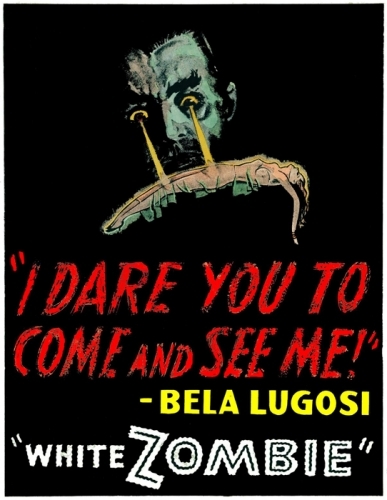 as well as a 1932 short subject "Intimate Interview with Bela Lugosi" filmed at his Hollywood home during the production of WHITE ZOMBIE. Short Subject "Intimate Interview with Bela Lugosi"